The Empty Nesters: Happy Memorial Day!! Getting ready to leave to go camping in celebration of Memorial Day!! I hope you all have a safe and wonderful weekend. See ya'll back here on Monday!! P.S. GRADUATION WAS VERY NICE. I DIDN'T EVEN CRY (TOO MUCH) LOL!! I PROMISE TO POST PICS ON MONDAY!! Have a fun and relaxing time, Carrie! I just found your blog over the weekend, and I'm really enjoying reading your past posts. 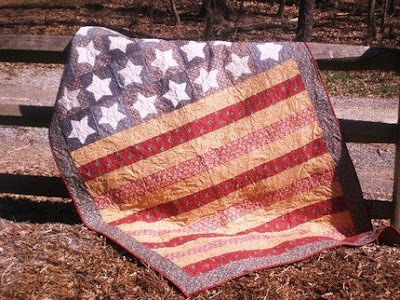 Hope your weekend is going well; love your Americana flag quilt.